Leopards are being killed in India on a regular basis. In a shocking incident recently, a leopard was "pushed out" of its habitat and then shot from a short range. In retaliation, the injured leopard pounced on one of its attackers before collapsing. It is believed that the leopard was killed by villagers for game or by poachers as opposed to it being attacked by villagers in self defense. 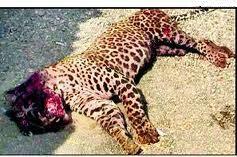 The seven-year-old male leopard was shot dead. The bullet had pierced the heart, lungs, diaphragm, liver and the anterior parts of the kidney and intestine. According to a report, "The abdominal cavity was full of blood and the leopard died due to circulatory and respiratory failure due to injury to heart and lung. According to sources, the leopard was spotted by villagers on a nearby hill but it was not in the fields or inside the village, as rumors suggested. A forest official said that it was unbelievable that the leopard would have first injured the villagers, then they would have run to their houses and brought back the gun, while the leopard would be waiting for them to return. Such incidents have been happening almost every month, and only show the level of insensitivity of people towards harmless animals whose habitat has been encroached upon by humans. Animals would never harm human beings until they are cornered with the intent of being brutally murdered. In most such cases, even the forest officials stand and watch this game of death as mute spectators. They feel helpless due to lack of adequate man power and weapons. These heinous acts of crime against voiceless animals must be stopped immediately. The government agencies must ensure that the wild animals are protected from insensitive and insane murderers and poachers. Animals are as much needed to save our planet as much as humans are needed. The local population needs to be educated about how animals are necessary to exist in order for us humans to exist on the earth.